Why do I need an education from Windsor Park? The currency markets provide everyone with some of the greatest lopsided opportunities to make profits, but not without risk. If you plan to step into the exciting role of a currency trader, you must understand the “specific language” of the industry, as well as the techniques, tools, and mindset. We will train you how to think and act like a professional currency trader. You'll also receive training on how to successfully use our automated software. The Windsor Park FX staff and training system are here to assist you along your educational journey to excellence in FX trading. How will Windsor Park FX’s Trading Software and discretionary strategies help me trade successfully? · Our systems work well on multiple currency pairs. · Automatically self adjusts on the fly for changing market conditions. · May allow you to make money as the market moves in either direction. · Software can be set to trade 24/5. How long can I trial the software? Our downloads are free to trial on unlimited Demo accounts, for an unlimited period of time, until you are comfortable with it and choose to join! Additional programs are available to members only. Typically, a new trader joins Windsor Park as a member after running a practice account for about 3 - 6 months, but feel free to take more time if you need it. The demo is unlimited. We are inviting you to join as a member, not trying to sell you anything. There is no pressure. You will receive a training manual with critical information and "tricks of the trade" to get you started. You will be able to join a local trading group in your area or start your own. You will have accurate market information at your fingertips. You will have access to robust software that can automate your trading. You will have access to charts and unlimited practice accounts from your preferred broker. You will have Free access to our proprietary algorithms for practice accounts for as long as you need them. You will have Live customer support. Since 2008, our educational membership club (like a gym) for Forex professionals and beginners has taught our members around the world how to trade and maximize their profits using software we developed. Our EA's are a compilation of successful software that has been developed in house, and has been simplified for both beginners and pros! If you plan to step into the exciting role of a currency trader, you must understand the “specific language” of the industry, as well as the techniques, tools, and lingo. You'll also receive training on how to successfully use the MT4 Trading Platform and our Expert Advisors. Windsor Park's training systems are here to assist you along your educational journey. Manual Trading sessions are also available to our members. How will Windsor Park’s Software help me trade successfully? Works well on multiple currency pairs. Automatically self adjusts on the fly for changing market conditions. May allow you to make money as the market moves in either direction. Easy to make adjustments to your strategy, You are always in control. New strategies are constantly researched at Windsor Park and successful strategies are shared with all members. of time, until you are comfortable with it and choose to join! about 3 - 6 months, but feel free to take more time if you need it. The demo is unlimited. We are inviting you to join as a member, not trying to sell you anything. There is no pressure. How do I convert my trial account to a live trading account? fee, dues, and paperwork are received, verified and approved. time $3,000 membership fee and $195 monthly dues. · Establish a live trading account with an MT4 Forex broker. · Now, you may use our software on your live MT4 trading platform. Why is Currency Trading safer than trading in the stock market? dollars worth of transactions in the stock market daily. As of 2016 its over 5 Trillion a day. and everyone else, to get into and out of trades whenever you want. Can I lose all my money? you avoid some common pitfalls. What are the benefits of using Software Automation over Manual Trading? members spend less than 15 minutes per week). · Using Software Automation can help to minimize bad judgment and emotional trading. Can I use the Clubs Software on more than one live trading account? · Monthly dues are $195, which includes activation of one live account. · Yes, contact us for information on additional discounted account activation. · You may read the full policy text on our website. · We are here to help you with your questions as often as you need us. email. Our members all agree and we’re sure you will as well! How do I keep my computer from turning off? Now that you have successfully installed an Expert Advisor into your MT4 trading platform, you'll need to keep your computer on and connected to the internet. You can let the screen turn off with no problem. Also, it's okay if you minimize the MT4 platform (so that you can still see it in the task bar at the bottom of your screen). The software will still be able to trade. You must keep your laptop open, and make sure that your computer doesn't go into a sleep mode, so the software will be able to trade. And be sure to tell your family or roommates that they shouldn't turn off or restart your computer. This is worth repeating, so be sure to tell your family, roommates, and pets (who knows? they might understand) that they shouldn't turn off or restart your computer. In Windows 7 and Vista, click the Windows Start button in the bottom left hand corner. Then click on Control Panel. In the Control Panel window, click Power Options. If you don't see Power Options in the Control Panel window, that's okay because it is probably hidden behind "System and Maintenance" (in Vista) or "System and Security" (in Windows 7). In Windows XP, click the Start button in the bottom left hand corner. Then click on Control Panel. In the Control Panel window, click Power Options. If you don't see Power Options in the Control Panel window, that's okay because it is probably hidden behind "Performance and Maintenance". 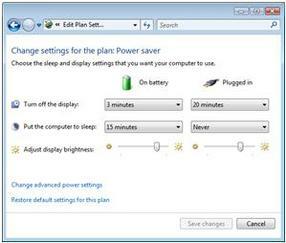 The following settings are for when the laptop is plugged in. 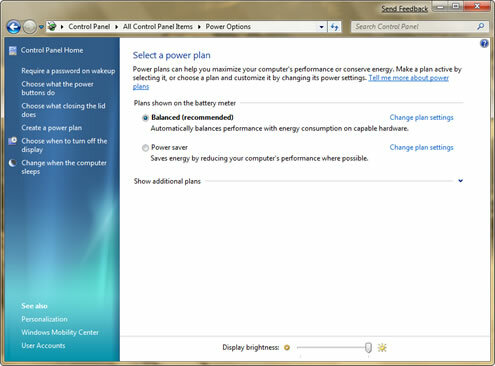 Start>Control Panel>All Control Panel Items>Power Options This pops up when you click "Change Plan Settings" Power Options in Windows XP Are you running Windows 8? Stay tuned, we'll add some info for that as well, soon-ish. This pops up when you click "Change Plan Settings"